Since it was first announced, import from CircusPonies to Outline has been going down the evolution road. It was a standalone import utility, part of Outline with some magic in Terminal to be accomplished, part of Outline with properly formatted commands for Terminal (still seeing those missing string spaces in nightmares), and improved part of Outline with attachments and images imported correctly. The little neat thing is living in Outline > File > Import. To meet Import Screen personally, please feel welcome to download Outline for Mac, v3.14.2. Already in the Mac App Store and Outline Store! This entry was posted in Circus Ponies, New Features, Outline for Mac by Outline Team. Bookmark the permalink. Is there any fix for this? I have hundreds of CP notes I need to put into Outline. This update brings the import window, and the next one will deliver improved formatting. Stay tuned! 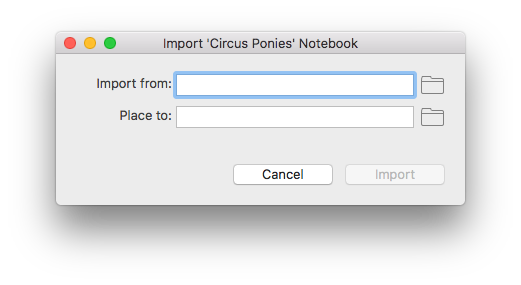 You guys took the time to make a Circus Ponies Notebook importer!? You just saved my life. I’m buying now! Thank you, thank you, thank you! Happy to hear the import thing can be useful to you! Feel welcome to recommend it to friends and colleagues:) If they consider purchase, make sure they are aware of the coupon code CIRCUSPONIES. It cuts 30% off for orders made in the Outline Store here on outline.ws. When I try to use this import screen (clicking the folder icon and navigating to my CP notebooks folder) all of my notebook.nb files are grayed out and cannot be selected. Please accept our apologies for the inconvenience and lack of instructions! The import window supposes you made Step 0, i.e. exported your .nb notebook to HTML (using the original Circus Ponies app). I see no “Export to HTML” command in Notebook, do you mean the Export as a Website Menu option? Because when I use that it creates a number of html files, but they’re all grayed out, I can’t select them in your Import Circus Ponies Notebook tool. That’s right, the option is ‘Export as a Website’. When it comes to choosing those HTML files in Outline for import, it’s the matter of choosing the folder containing those HTML files, and not each file separately. Well. I found the solution. The CP .nb file has to be exported as previous manual instructions and then…only then can be imported to Outline using Outline > File > Import as indicated on the top of this page. I wish the instructions were much clearer. Sorry for the lack of instructions! Fixing it asap (posting an instruction to YouTube, among other things). Please accept our apologies for the inconvenience! The import window supposes you made Step 0, i.e. exported your .nb notebook to HTML (using the original Circus Ponies app). Our tech support team is contacting you for step-by-step guidance via email. Tech support rescue rangers are on their way to investigate and fix the case urgently! Okay, I purchased Outline, hoping to import the work I had done in Circus Pony Notebook. I have version 3.19 (I did not upgrade when it was originally offered and, when I decided to do the update, the iOS version was no longer available). Each version of Circus Ponies which is capable of creating export to HTML is supported in a way, for import to Outline. Circus Ponies v4 does the export job best, but older version can do thing too. Sending a tech support rescue ranger to assist you! Check the inbox. When I try to import a CP notebook (that has been exported as “Website”) Outline crashes, I get “Outline quit unexpectedly”. CP 4.0.7, O 3.15.2 (39.152.500) OSX 10.12.2. O creates a folder with the title, but then crashes and nothing else happens. Does it matter if the folder has spaces in the name? I was using the Import menu item; is the terminal method a more stable import method? Followup: This only happened on one notebook I tried importing (of course it was the first one I tried). I believe it was an error caused by CP not properly exporting a particular page (corrupted the HTML somehow, the lists were not expanded and it didn’t have the page corner like the other pages) and Outline had a problem with that bad page. The other notebooks I tried worked ok (for text), so ultimately I think this was an issue with CP poorly exporting a particular page that caused Outline to crash. Thanks for reporting! We’d really like to investigate this case. Our tech support rescue rangers will email you to ask about details, if you don’t mind. I am trying to import my CP notebook before buying Outline, but Outline crashes. When I export CP as a webpage, I am notified of an error in an HTML page, but not what that error is. I suspect this is the cause of Outline crashing? I have tried both the manual import using the Terminal-related instructions, as well as the GUI option in the Import choice. Any suggestions? Sorry for the inconvenience with those crashes! Tech support rescue rangers will reach you out for investigation and resolution, in 24 hours. Well, I just bought it anyway. Hope you can help. When I open the HTML files on Safari, I can’t identify an error. What regards keyword function, can you tell us more about your note-taking workflow? Please drop an email at support@outline.ws to discuss things.